Warrior II (virabhadrasana II) is among the most iconic of yoga poses. In its classic form, it expands the chest, stretches the groins, and strengthens the legs. An excellent pose for beginners and seasoned yogis alike, warrior II can be used to warm up the hips and prepare the body for more challenging poses. Although it is safe and accessible for most practitioners, warrior II does require muscular stamina and helps to cultivate endurance. While the traditional version of warrior II is powerful in its own right, variations can be a fun and interesting way to prepare for more complex asanas or to adapt the pose in a way that’s optimal for your body. For example, adjusting the orientation of the pelvis and feet can change the work in the hips and decrease the intensity of the pose. Adding torso and arm variations can help prepare the upper body for arm balances, twists, and backbends. Traditionally, the feet in warrior II are at least a leg’s length apart. The front foot points toward the front of the mat, and the back foot is either parallel to the back edge of your mat or turned in slightly. The front heel is usually in line with back arch. The front knee is bent to a 90-degree angle and positioned over the ankle. The arms are extended out to a T at shoulder height, and the torso faces the long edge of the mat. Working from that foundation, here are a few variations on the classic pose that you can use to customize your practice! Warrior II is challenging to sustain because the quadriceps of the front leg have to work hard to maintain the deep bend of the knee. If the pose becomes too tiring, consider shortening the distance between your feet to reduce the load on the front leg. Shortening the stance can also be helpful for practitioners who feel unsteady in the pose. For students with tight hips, it can be helpful to align the feet heel to heel rather than heel to arch. Slightly widening the stance will reduce the amount of external rotation required for the front thigh, and can also reduce compression through the lower back. Very few practitioners are able to keep their hips squared to the long side of the mat and their knee bent at a 90-degree angle without torquing the knee or compressing the lower back. Instead of trying to square the hips fully, turn the pelvis generously toward the front foot until the front knee is easily positioned over the ankle and the pelvis is neutral (you’re maintaining the natural lumbar curve). Keeping the front knee positioned over the ankle, slowly turn the pelvis toward the long side of the mat to find your ideal hip opening. If the knee begins to fall inward, you have gone too far. For practitioners who feel low back compression, turning the pelvis forward first can help to create more space and prevent hyperextension (over-arching) of the lumbar spine. Once you’ve found your ideal hip position, turn your back foot inward until the angle of your foot matches the angle that your pelvis is turned forward. By turning the foot in, you are aligning the back leg to create a neutral position in the hip. When the back toes point directly to the side of the mat (rather than angled forward), the back leg is externally rotated relative to the pelvis, which can cause compression in the low back. When done properly, warrior II is an excellent pose for strengthening the external rotators of the front thigh. These muscles are essential for hip stability in daily life. To focus on the activation of this muscle group, practice warrior II at the wall. Place your mat lengthwise against the wall, and stand in the middle of the mat facing the inside of the room, bringing your feet wide. Position your back heel against the wall, turn your front foot toward the front of your mat, and place a block (either on its skinny or medium setting, whichever positions your knee directly above your ankle) between your front knee and the wall. As you root your back heel into the wall, press your front knee into the block to activate the external rotators of your front thigh. Twists and backbends are poses that require length in the sides of the waist. By incorporating a side stretch into warrior II, you can prepare the body for more complex poses. From your warrior II, spin your front palm up, sweep your front arm up alongside your head, and bring your back hand to your rear leg to create a side stretch for the torso. You may place your back hand on your calf or your thigh, depending on the length of your arm and the depth of the pose. Reach up and overhead through your front fingertips and down through your back fingertips. Keep the weight on your back hand light, and support your torso through the strength of your core. Variation: You can transform exalted warrior into a backbend by directing the chest toward the front rather than the side of the mat. Focus on lifting the chest and initiating the backbend from the upper thoracic spine. In both of these versions of exalted warrior, make sure to engage the core in order to support the low back and prevent compression there. Keeping warrior II legs, interlace your hands behind your back and hinge diagonally forward, bringing your torso inside your front leg. You can rest your shoulder on your front thigh for support or (more challengingly) bring it inside your front knee and release your head toward the mat. Keep your fists lifting toward the sky, retract your shoulder blades, and widen across your collarbones. Humble warrior is excellent preparation for poses with the arms in extension (behind the body). These include locust (shalabhasana) and bow (dhanurasana), as well as the bound standing poses, such as bound side angle, bound triangle, and bird of paradise. 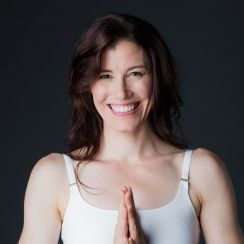 It also helps prepare for arm balances that require the torso to snuggle deeply inside the legs—including crane (bakasana), with the knees outside of the upper arms (as opposed to propped on them); shoulder pressure pose (bhujapidasana); arm pressure pose (eka hasta bhujangasana); and firefly pose (tittibhasana). In warrior II, the arms are traditionally at shoulder height, which allows broadening across the chest and encourages shoulder stability. Adding arm variations can help warm up the shoulder girdle in different orientations. For example, reach the arms overhead to prepare for poses such as handstand or wheel. Use different hand positions to invite a slightly different rotation for the upper arms at the shoulder joint. For example, hook the thumbs and extend the fingers up to the sky. Or cross the thumbs and interlace all fingers except the index fingers (shiva mudra). Or interlace the fingers and press the palms to the sky to encourage external rotation at the shoulders. You may also incorporate props to intensify the shoulder work: Hold a block between the palms or forearms; or either stretch a strap between the hands, or loop it around your wrists. Explore these variations to help you prep for more challenging asanas, or to deepen your experience of this yoga classic. Either way, have fun!